What the ash can tell about. 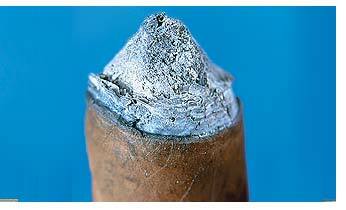 There's much more than you could ever expect that Cigar ash can tell you about the cigar's origin. 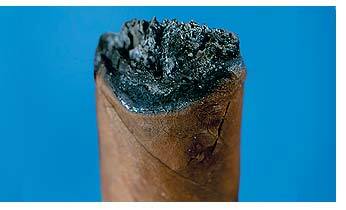 That's why the ash is of the same importance for experienced smokers and tasters as cigar taste and aroma. In fact ash is nothing but a mineral, an inorganic compound that remains after the tobacco leaves burning. All tobacco leaf contents that can give off taste and aroma while burning are transformed into volatile compounds, which are sensed through our olfactory receptors and taste buds. All the rest turns into ash. I decided to run experiment on my own lighting a cigar and enjoying its amazing taste and aroma for about half an hour. After 30 minutes of pleasure I took a sip of cognac putting on my glasses and proceed to the study of the ash, which had become a considerable length over the half hour. The time has come and the length of ash falls off. 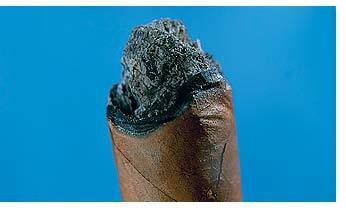 Usually this doesn't happen until the ash is at least an inch long � an absolute minimal length for ash on the cigar. The ash shouldn't fall before reaching this length even from easy hand movements. In case it does, there is ample evidence that the cigar is not of a good quality. The quality of the tobacco leaves and the care the cigar was rolled with determine the �solidity' of the ash length. Mechanically rolled cigars are characterized by unstable ash, unlike hand-rolled cigars that vice versa have rather stable and firm ash. Besides that, leaves and roller's attitude are very important also. You'll hardly be able to enjoy a fine, neat length of ash if cigar was rolled from too short or torn leaves, or if the roller didn't make the cigar firm enough and left gaps between the leaves. 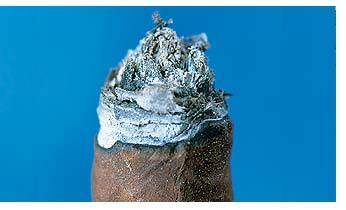 If your cigar ash edges and surface are uneven and it gradually crumbles round the edges, it means that unfortunately this is the case!